Passover is the 8-day Jewish holiday in which we ask questions at the seder table. For one quirky Jewish guy from Washington DC, Sukkot was the 8-day Jewish holiday in which he successfully answered clues with questions. My kids and I make it a habit of watching the well-known television game show Jeopardy! each night. If we skip a few nights, we rely on our TiVo to catch us up as we binge watch several episodes at once. While my young children rarely know the answers to host Alex Trebek’s clues, they really enjoy tuning in each night and I’m convinced they’re learning something. Over the past week, we’ve been fixated on the interesting, if a bit odd, champion named Matt Jackson. He’s taken the world by storm as he has successfully won eight episodes in a row. While he’s far from catching Ken Jennings, who won a record 74 episodes in a row, Jackson has certainly kept the show entertaining. The paralegal has amassed a winnings total of $230,610 so far and will hope to add to that tonight. Early in the show, Trebek asked Jackson to talk about his “very different” parents. 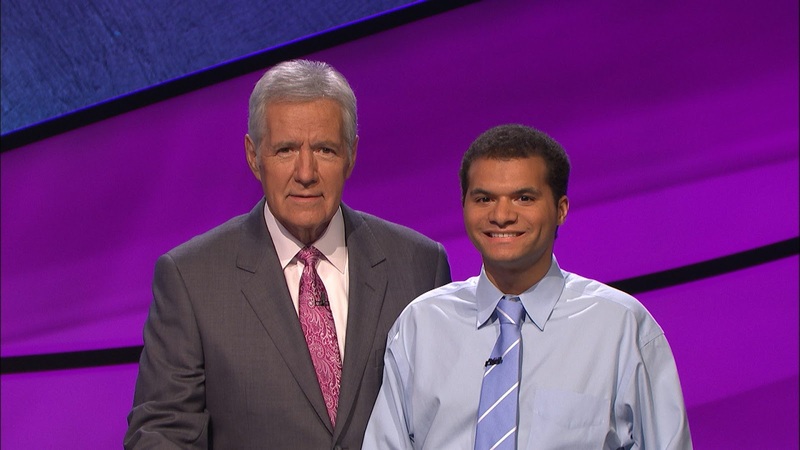 He responded,“My mother is white, liberal and Jewish, and my dad is black, Christian and conservative.” Trebek responded, “Whoa — hello!” The Jewish bi-racial contestant is only 23-years-old and was 22 when he auditioned for the show. As we saw with the lengthy Ken Jennings streak, after several episodes Trebek struggles to find topics to shmooze about with returning champions. On a recent episode before Jackson won his seventh show in a row, Trebek asked him how he acquired all that knowledge. *Note: Matt Jackson contacted me to clarify that, "While of course my mother is Jewish and that's all that matters from the halakhic (Jewish legal) point of view, I am currently non-religious, or at least entirely non-observant. My Jewish family members are a huge and continual influence on me -- particularly through their lived commitment to education -- but I don't want to mislead anybody into thinking I am currently capable of representing Judaism as a faith." Matt Jackson’s quirkiness (some are theorizing that he has Aspergers) — his awkward smiles at the camera, his quick, loud responses, and his ability to take huge leads over his opponents night after night finding all the Daily Doubles, has led to him quickly becoming a pop culture phenomenon early on in this new season of “Jeopardy!” I love that Jackson has talked openly about his Judaism and his family’s Jewish rituals including the Passover seder. “Jeopardy!” has always struck me as a “very Jewish” game show because it focuses on knowledge and asking questions. It requires competitors to have a vast knowledge of many subjects, which is at the core of Judaism — just think about the plethora of topics covered in the Talmud. In the course of the history of “Jeopardy!” there have been a disproportionate number of Jewish contestants relative to our population in North America, including rabbis like Rabbi Joyce Newmark and Rabbi Sari Laufer. No doubt, “Jeopardy!” champ Matt Jackson is the most interesting one yet. I feel blessed that my kids enjoy our nightly ritual of watching “Jeopardy!” and you can bet we’ll be cheering on Matt Jackson as he hopes to continue his winning streak. Update: As of October 12, 2015, Matt Jackson has 12 wins under his belt and close to $400,000 in prize winnings (4th on the all-time leaderboard). While he told me that he doesn't want to mislead anyone into thinking he is "currently capable of representing Judaism as a faith," he did a fine job explaining the concept of Tikkun Olam (social justice) in a recent episode when Alex Trebek interviewed him. Final Update: Matt Jackson had the show's 4th-longest winning streak, surpassed only by Ken Jennings, Julia Collins, and David Madden. His 13-episode streak ended with a loss on October 14, 2015. Jackson's total winnings amount to $413,612. did you notice that mr. Jackson wagered $5,000 today and was wrong, but only lost $5? a major mistake and he knew it. He wagered $5, the minimum amount, not $5000. If you watch it again, he said "five" only. While for a regular clue you can shorten the value ("I'll take Lit for 6," giving the Literature clue for $600), for Daily Doubles, the Jeopardy Rules specify that you must specify the exact amount. He intended to wager $5 as sports are a weak area for him. And even if you took away $5000 rather than $5, he would have wagered more on Final Jeopardy and won anyway.